Today is the beginning of a new series on this blog where I interview illustrators and others in the publishing industry. I've met so many interesting people at art school, conferences, and online, who have stories I want to hear! 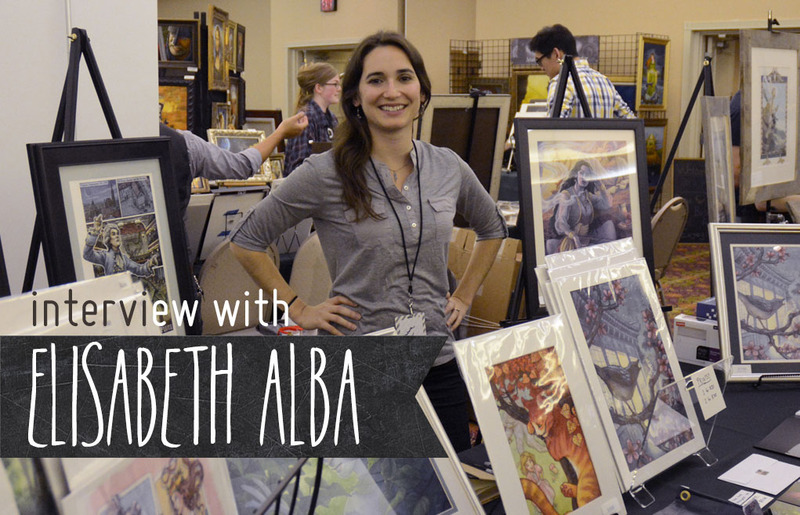 I am honored to have our first interviewee, Elisabeth Alba, on the blog today. Elisabeth has been a freelance illustrator in the children's book and fantasy industries for several years now, and recently quit her part-time job to go full-time. Elisabeth and I have never met in person - YET - but we've been online acquaintances for a year or two. I was curious about how she has managed to build up her freelance career from the ground up, and what it's like being married to ponytail-rocking fellow illustrator Scott Murphy. When did you first decide to become an illustrator, and what did you do to get started? 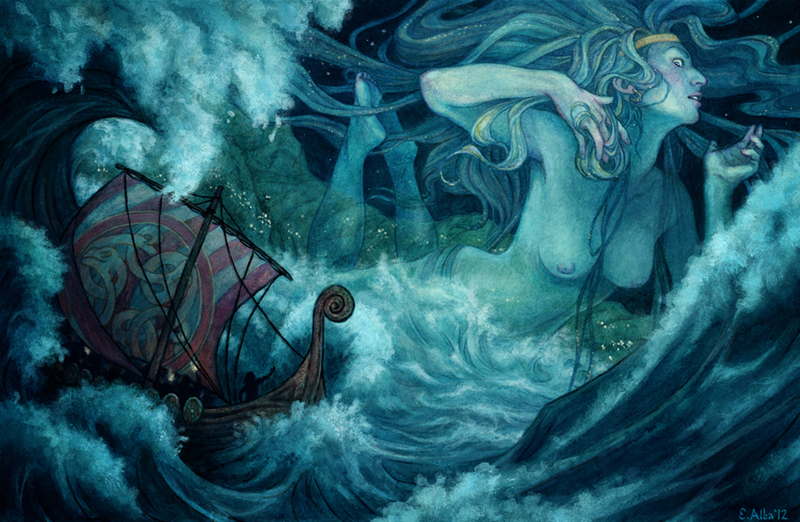 I loved reading, picture books, graphic novels, fantasy movies, animated films - what all illustrators like, really! I had this urge to create things that would be seen by other people on book covers and inside books so that they'd have the same pleasure I got when looking at them. It definitely started in high school, if not earlier, but I still struggled a bit thinking maybe I should be a doctor or biologist or an English professor or something more stable career-wise. I always knew I wanted to create art though, and realized it had to be illustration if I was going to be in books. So in college, even though I was at a state school with no illustrated-related art classes, I tried to take courses elsewhere that would help me learn about illustration. I majored in English as well as art so that I could take children's literature, film, and comics courses. I wasn't learning enough about the business side though, so I went to graduate school at SVA in the Illustration as Visual Essay program headed by Marshall Arisman. What was your first commission, and how did you receive it? 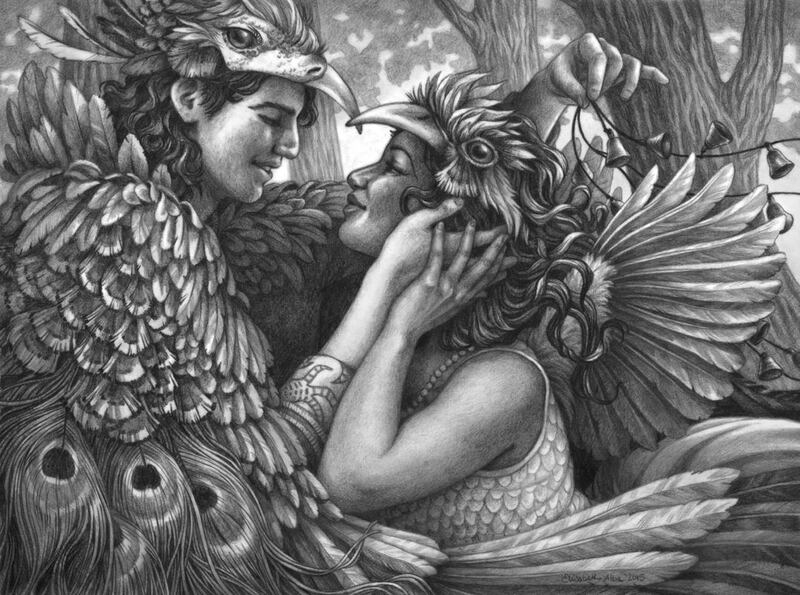 I used to take fanart commissions in college that paid a piddling amount, but I'd say my first illustration commission that made me feel like I was a professional illustrator was a picture book I did for a local author who was self-publishing. My favorite English professor/mentor got me in contact with him. It was the highest paid illustration job I'd ever done at the time but looking back at it now makes me laugh. LOW paying, and the art I did for it was lame. But that was 2005. It was an experience! Were you working a day job while beginning your career? Soon after graduating from SVA, I got a job as the communications assistant at a private school in NYC. It was part time, and even though it had nothing to do with art, I really enjoyed it there. I just left it this past August 2014 after 6 years because Scott (husband) and I moved away from NYC to Massachusetts. So since I was leaving, I figured it was time to try freelance. How did it feel when you finally went full-time? It felt totally weird not having a day job. Nearly my entire life had been at school and then 6 years at a day job, and I had never just been on my own working on my own time (because let's be honest, my summers during college were spent drawing Harry Potter fanart, watching Star Trek, and staying up until 6 am playing Tropico 2 – I am much more responsible now!). Made me anxious but also felt awesome. It would be hard to go back to having a job, if I ever need to (and I'm not ruling it out). I know you do some work for private clients. (Meaning individuals and self-publishers.) How do they find you? They usually find me through SCBWI (Society of Children's Book Writers and Illustrators). It also helps that my last name begins with an A so I'm one of the first artists they see when they start searching! Have you noticed any differences between working with individuals versus working with publishing companies? Art Directors usually know everything they need from the beginning and can give you all the details. But sometimes, private clients hire a little too early in the process and aren't really sure what they want, so they ask for lots of revisions. That said, I have been very lucky with the majority of the private client jobs I take, and have made some great pieces doing fun projects! One of your specialties is drawing whimsical maps for both real and fantasy lands. How did you end up doing this? This started with a private client job! 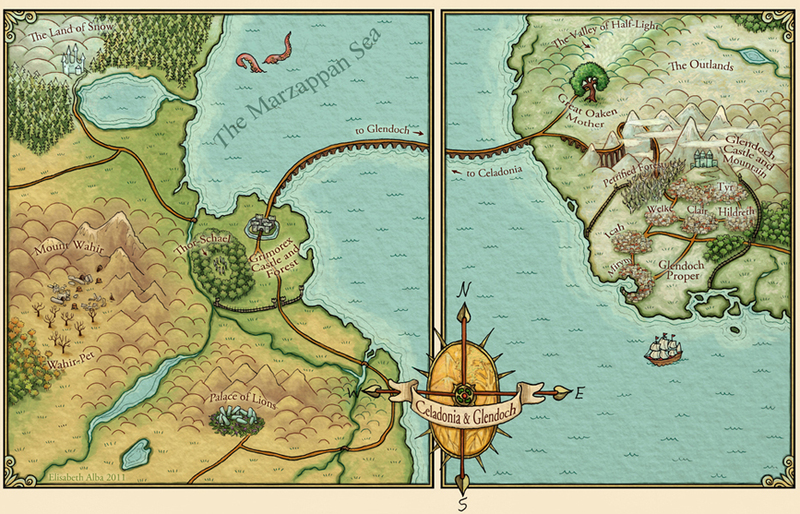 She needed a map, along with other illustrations, so I just did it and it was actually really fun to work on. That one map lead to all of my other map jobs. They're like puzzles, a fun challenge, and you can do them in so many different ways. If I'm getting tired of painting or drawing people, it's a nice break to have a map job to do. What are some of the challenges and perks of being married to another illustrator - especially one working in such similar fields as yourself? It's filled with perks! I guess, for us, the only challenge is that one of us isn't the 'moneymaker.' Our careers are fine at the moment but obviously being an illustrator is not nearly as stable a job as most other things...If one of us had a stable job, life would be that one bit less stressful. And though we work in similar fields, there's no competition between us. Our styles are just too different. I wouldn't be taking a job away from him. And we both work in different genres, so if Scott wants to branch out into more of what I do I can help him with that, and vice versa. Do you two help each other through artistic crises of self-doubt and loathing? Neither of us likes to be down on ourselves in public, or make status updates about frustrations and such. So it's great that we can turn to each other and vent about something and get it out of our systems. If Scott weren't an artist, he wouldn't really be able to respond appropriately, unless he appreciated art and knew the community enough. And I know not all artist couples can do this, but Scott and I work together in the same studio room and we have no problem working back to back every day. Always good to have someone who can look over your stuff throughout the day, or who can pose when you need some last minute photo reference! 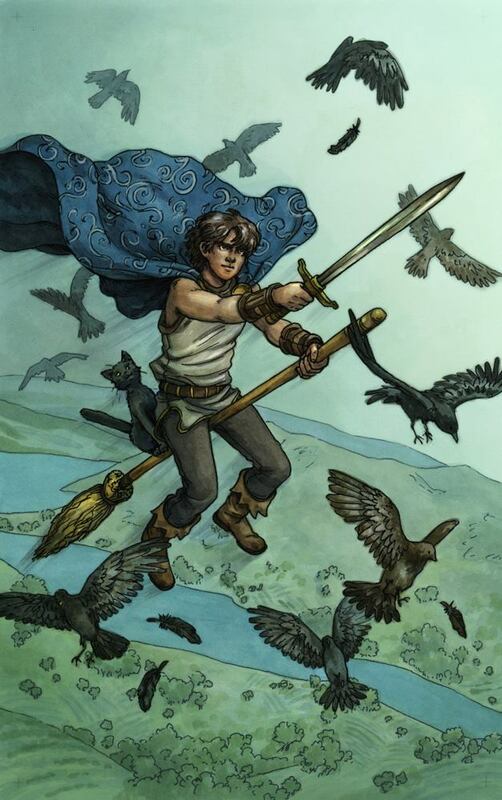 You are currently working on a massive project - an entire tarot card deck! How many illustrations do you have to complete, and how much time do you have to do them? 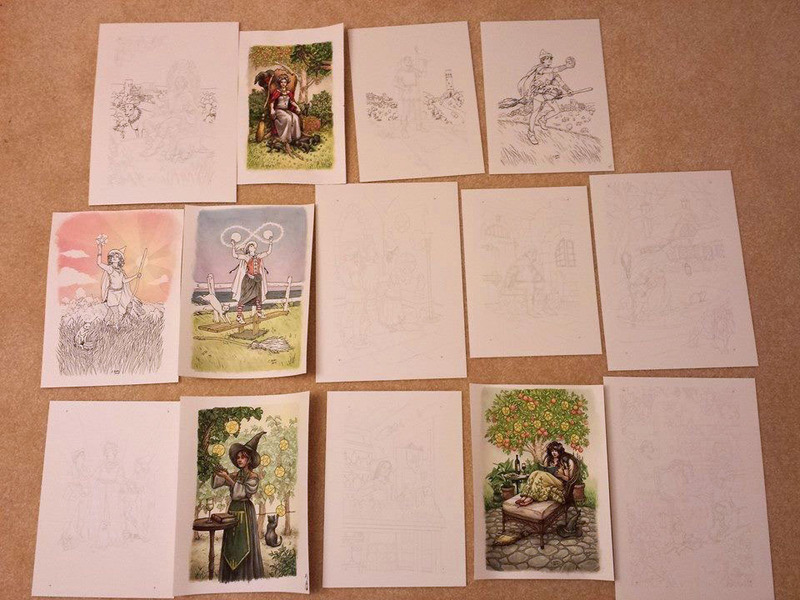 The tarot deck involves creating 78 fully illustrated cards and one card back design - 79 images total. (Ed. note: holy cow.) The publisher is Llewellyn Worldwide. I started in July 2014 and I have until the end of December 2015 – a year and a half. Every piece will be pen and ink and watercolor. I have never created that much painted art before within this time frame. It's... actually insane. If you think about it. But that's the deadline so I gotta stick with it! Fortunately I have gotten pretty efficient from many previous short deadline experiences in publishing. I am 11 cards away from being halfway done. What's it like working on such a long-term project? It's been a really fun project though. I work with an author, Deborah Blake, who has given descriptions for every card and is also writing a companion book. We get to work together, instead of solely through the art director, and we get along great! Her descriptions are fun and not too crazy detailed. So I am enjoying working on the deck, but it does greatly cut into my time and I've had to turn down work. I can still take on some other jobs during this time, but I've been very selective. 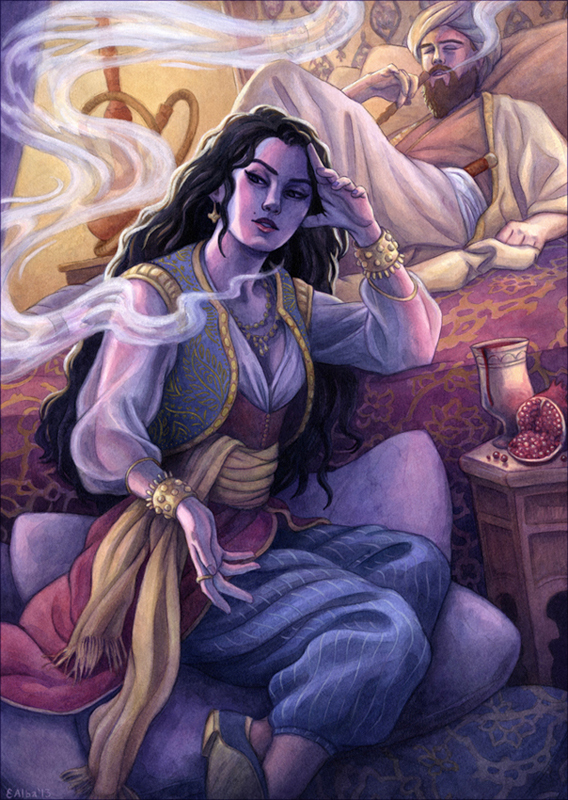 Do you dream about tarot cards at night? Fortunately I haven't started dreaming of tarot yet!!! How do you want to see your career evolve from here? Are there certain markets that you're interested in pursuing? I can't think about it too much yet because of the tarot project (my nightmare right now is to get my dream job with a tight deadline and I can't fit it in), but I'd like to get more jobs in book publishing. My dream job would be a middle grade series with painted covers and black and white interiors. But I'd like to dip my toes into everything really. I've started delving into gaming a bit. I've started attending conventions and sell prints and original paintings. If one particular market dries up temporarily, it's always good to have contacts and jobs in a different market. What would be your #1 tip for aspiring freelance illustrators? Don't be afraid of having a day job (part time if you can do it! ), but if you are full-time freelance, don't forget to stretch your legs a bit... and don't forget to eat!!! Oh trust me, Elisabeth, I never forget to eat. Thanks a bunch for taking the time to provide your insight and experiences on this blog! Such a great and fascinating interview! Great interview. Love your work !